Named after a place in Cornwall, this is Zelah. She is 3 1/2" tall and is made of unusual soft, woolly, white German alpaca. Combined with this for her tummy and ears we have used gorgeous hand dyed German mohair in shades of lime green with very slight dabs of pink and lilac in the pile. This fur is soft and silky and a really gorgeous colour. Zelah has lime green cashmere pads and paws, a green stitched nose and shiny black German glass eyes. 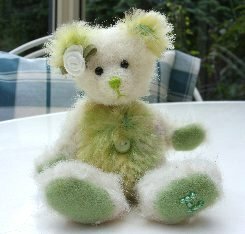 As a little girl bear, she has a ribbon flower over her right ear, in this case a white flower and a lime green belly button. We have lightly filled her with steel shot so she has some weight but is not as heavy as some of our bears. She has a wobble head joint and is really, really sweet, I hope you like her. Zelah costs £36 plus postage. Please note that as with all our bears, Zelah is not a toy and is not suitable for children. Sorry - Zelah has been adopted.